New Uber users qualify for a discount on the first ride when using a promo code. Discounts for first-time Uber rides ranges from $5 to $20 depending on location. Click the Sign-up button below to apply and get a promo code for first time Uber users. Up to $20 off first UBER ride. Discount automatically applied. 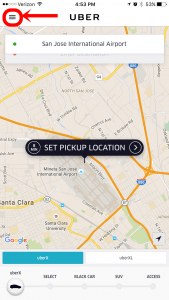 If you’ve already signed up for Uber, downloaded the app, but haven’t taken a ride. 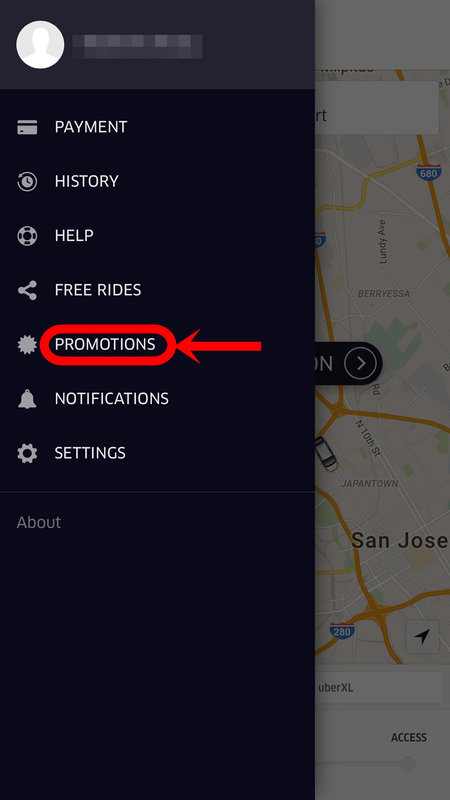 Simply insert the promo code in the promotion section of the Uber app to receive a first-time user discount toward your first Uber ride. Uber New Riders: Apply this Promo Code to Receive up to $20 toward your First Uber Ride. First-time Lyft users receive a free ride credit toward first Lyft ride. 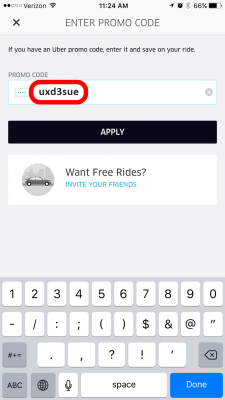 How to Apply an Uber Promo Code? Follow the steps below if you have already applied an Uber account but have not taken your first ride. 1) Download and log on to the Uber app on your smart phone. 2) Choose “Settings” on the upper left corner of the screen. 3) Choose “Promotions” in Settings. 4) Enter promo code “uber4ride$”. Click “Apply”. Discounts for existing UBER riders are not common. Below are a few tips on finding coupons for existing riders. 1. Check your credit card company for special offers. Apply a new account. A credit card will be needed. Download the Uber app on your smartphone. When you’re ready to go, set your pickup location and tap Request. If you want to know about how much your trip will cost, tap Fare Estimate. Once the address or name of your destination is entered, you’ll see the route your driver will take as well as your ETA. No need to give directions. Before your driver arrives, you’ll see their name, photo, car make and model, and license plate number—so you know you’re hopping in the right car. If you’re sharing a ride with friends who have an Uber account, easily share the cost by tapping Split Fare. If you want friends and family to follow your route and know when to expect you, you can send a text message through the app with a link to your trip. Once you finish a ride, the Uber app will prompt you to provide a star rating for your driver. Please give a 5-star rating if your ride was safe and reliable. The rating is very important to Uber drivers because it is a measure that Uber uses to evaluate drivers’ performance. For most people, on a scale of five, a 4-star rating may be good. But for Uber drivers, 4 stars are not good enough. When riders give anything below a 5-star, it brings down the driver’s average rating. An overall rating below 4.5 can lead to a driver being removed from Uber’s platform. Drivers try their very best to provide the best rides to customers. If you are happy with the ride, please provide a 5-star rating. Uber is the largest rideshare company in the world. As of June 2016, its services are available in 490 cities worldwide. Uber connects riders and drivers via smartphone apps. When a rider needs to go somewhere, she requests a ride on the app. A driver nearby answers the request then drives to the rider’s location and take her to her destination. Payment for the ride is handled by Uber and charged to your credit card on file. There is no cash exchange between the rider and the driver. Therefore, once your account is established, you can request a ride anytime. A low-cost option for any occasion. uberX is affordable, whether you’re heading out for the night or taking a ride to work when your own car is in the shop. It accommodates 1 to 4 riders. If you have a large group, UberXL is the cheapest way to move around the city. It accommodates 1 to 6 riders. Use UberSELECT for a luxury ride at an affordable price. You’ll get highly rated drivers with high-end sedans accommodating up to 4 riders. UberSELECT is the right choice for a big night out without breaking the bank. Share your uberX car and driver with other riders, and you’ll share the cost. Everyone gets a guaranteed fare that’s the cheapest Uber ride. An economy option if you are not on a time constrain. Request UberBLACK with a professional driver in a stylish ride. It’s a smart option for a business meeting or date night. UberSUV provides a premium high-capacity ride (up to 7 riders) driven by a professional driver. It can get your entire group wherever you need to go—in style. With an experienced, professional chauffeur, UberLUX provides an extremely high-end ride for the most special occasions.